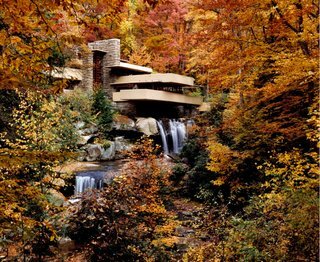 Nominated by the Frank Lloyd Wright Building Conservancy, the works include Fallingwater, Taliesin, and the Solomon R. Guggenheim Museum. Recognized as one of the greatest American architects of the 20th century, Wisconsin-born Frank Lloyd Wright designed over 1,000 structures and completed over 500 buildings in the U.S. With a career spanning 70-plus years, Lloyd Wright is known for his philosophy of organic architecture, pioneering the Prairie School movement, and creating Usonian homes. This past November, the Frank Lloyd Wright Building Conservancy—a private, nonprofit preservation organization based in Chicago—nominated eight Frank Lloyd Wright-designed buildings in North America to be considered for the UNESCO World Heritage List to be considered in July 2019. 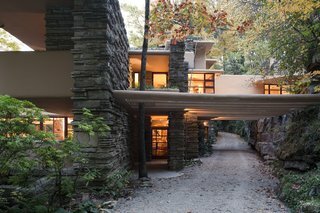 A collection was previously submitted in 2015; the new nominations include the world’s most famous example of organic architecture—Fallingwater. Take a look at the other contenders below. 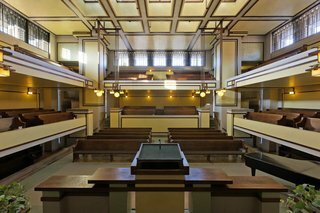 Completed in 1908 during Lloyd Wright’s early career and located near his home and studio in Oak Park, Illinois, Unity Temple replaced an older Unitarian Universalist Church that had burned down in 1905. 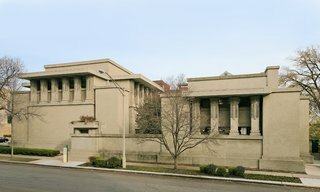 Unity Temple, view of west elevation. Unity Temple, interior view showing eastern alcove of Unity House, and balcony above. 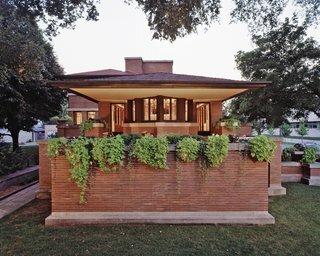 A residence that’s considered the epitome of the Prairie School style, Robie House in Chicago was completed in 1910. With its flat and broad profile, and lack of ornamentation, it was a deviation from the Gothic Revival, French Empire, and Italianate style homes being built during this time. Frederick C. Robie House, west elevation. Frederick C. Robie House, View of main floor facing east. 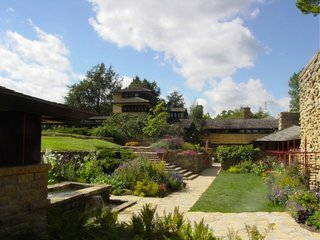 Built in 1911 in Lloyd Wright's boyhood hometown of Spring Green, Wisconsin, Taliesin, meaning "Shining Brown" in Welsh, was the architect's three-bedroom, two-bath home. It also contained a studio with a workroom and a small apartment; a service wing with stalls for horses; and a milk room. The house is strongly integrated to its landscape, and was built with local materials. 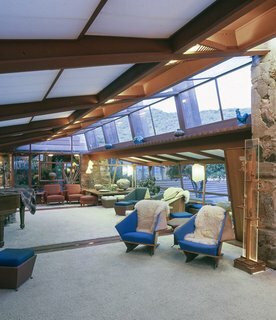 Taliesin, view to the northeast across living room. Inspired by seventh-century Mayan temples, Hollyhock House in Los Angeles was designed for oil heiress Aline Barnsdall, and built between 1919 and 1921. The living areas are arranged around a central courtyard and opens to a circular pool with a fountain at one end. Each of the rooms lead out to porches and pergolas. 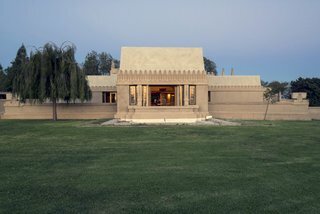 Hollyhock House, view of west elevation. Hollyhock House, view looking southeast in living room, with garden court (at left) beyond. Built in 1935 above a waterfall in rural southwestern Pennsylvania, Fallingwater was named a National Historic Landmark in 1966, and described by members of the American Institute of Architects as the "best all-time work of American architecture." Fallingwater, view of entry (center) with trellis beams extending across drive. 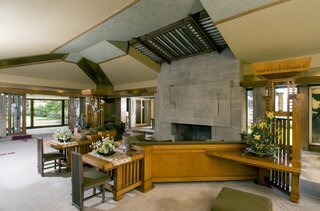 Fallingwater, main floor living area. 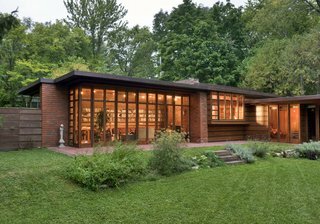 One of Lloyd Wright's first Usonian homes built in 1936 in Madison, Wisconsin, this house was the architect’s response to then-owner Herbert Jacobs’ challenge: build a decent home for $5,000. 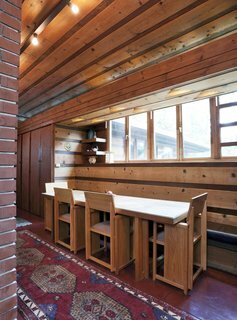 The term "Usonian" was coined to describe Lloyd Wright's approach to designing, new, affordable American homes that were free from European conventions, and would harmonize better with their native landscapes through a material palette of wood, stone, and brick. Herbert and Katherine Jacobs House, view facing northwest. Herbert and Katherine Jacobs House, view to the east of the dining alcove. 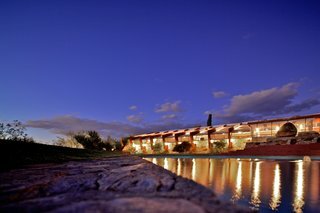 Located in Scottsdale, Arizona, this was Lloyd Wright's winter home and school in the desert from 1937 until his death in 1959 at the age of 91. 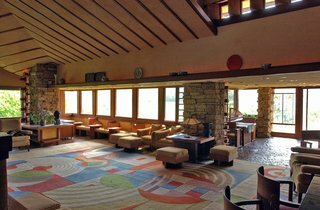 Today, it’s the main campus of the School of Architecture at Taliesin, and the home of the Frank Lloyd Wright Foundation. Taliesin West, view looking north. 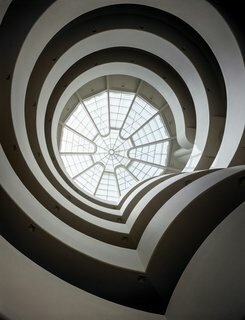 Designed with a spiral ramp for viewing the modern art house within its walls, the Solomon R. Guggenheim Museum in New York was completed in 1959, and named an official city landmark in 1990. 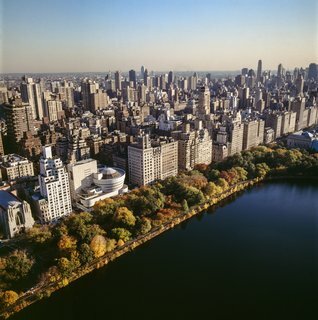 Solomon R. Guggenheim Museum, view looking eastward to Fifth Avenue with Central Park reservoir in foreground. Solomon R. Guggenheim Museum, view of rotunda and skylight from ground floor. 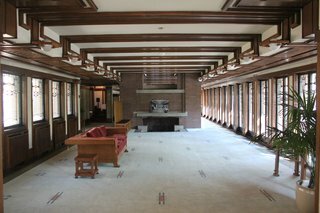 Learn more about the Frank Lloyd Wright Building Conservancy.